Bijou Lovely: art student tote. After a year of procrastinating after buying the supplies in Atlanta last year, I finally made myself an Art Student Tote in time for QuiltCon. I've been in need of a larger laptop/carry-on bag for awhile now, and thought that with a few modifications, this bag would be perfect for me. 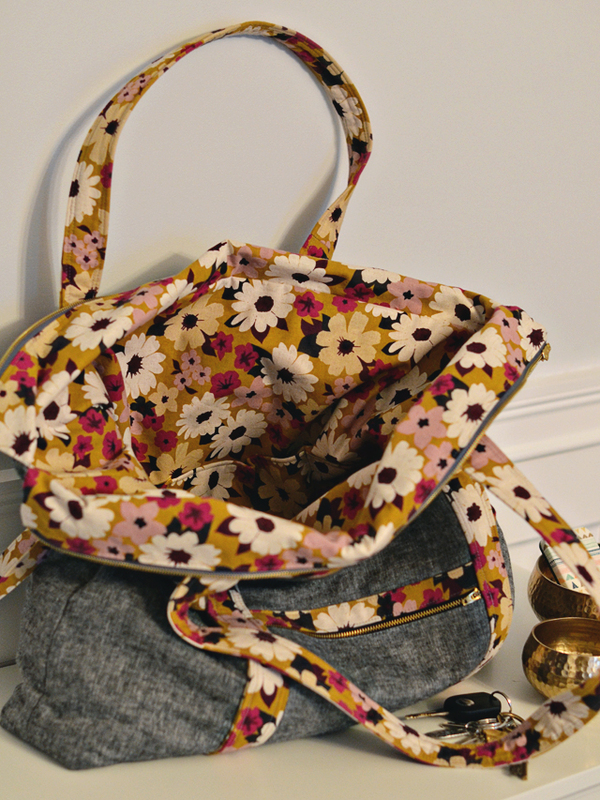 I had bought yardage of my favorite Melody Miller vintage flower print from her Ruby Star Rising collection from Whipstitch last year with the intention of making this bag with it. I decided to use it for the handles, accents, and lining rather than as the outer panels because I like to wear bags without a ton of prints on them. I bought some additional yardage of the print from Miss Matatabi and ended up having just enough to use for the bag. 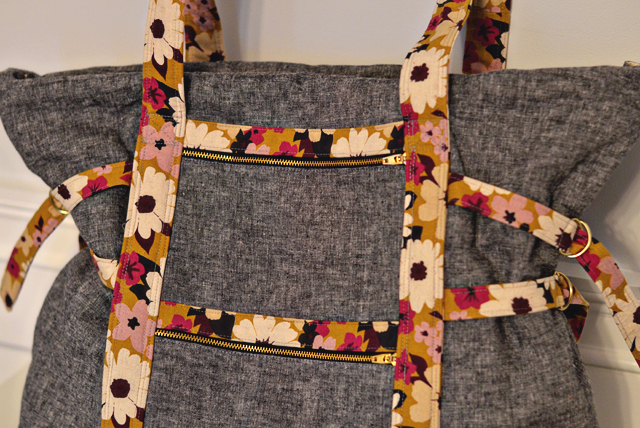 The main panels on the outside of the bag are made of yarn dyed Essex linen in Black, another of my favorite fabrics. My favorite part about this bag is all of the hardware, which makes it look really professional! I used denim zippers and gold d-rings on mine. I made the Option B version of the bag, which features a top zipper panel to close the bag and make it larger if necessary. I made my panel about 4.5" tall, which is about half of what is recommended in the pattern. The inside has lots of pockets for my laptop, notebooks, pens, etc. Most importantly, it has a zipper closure on the top so I don't have to worry about my stuff falling out when I'm traveling. It's the perfect size bag to fit under the seat of an airplane, and holds my laptop, small purse, notebook, knitting or hand sewing project, water, and more with plenty of room to spare. 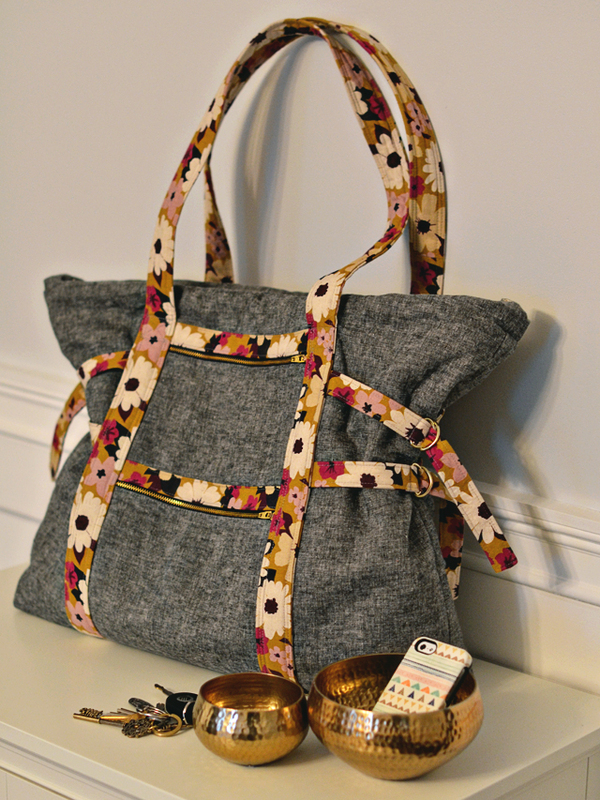 Most of the modifications that I made to the bag were to make it more durable as a carry-on tote, since the original pattern seems to be more intended as a purse. I made a list of all the interfacing information in case you'd like to replicate this durable carry-on version of the Art Student Tote. It was pretty simple to make aside from all the cutting and interfacing, but make sure to use a heavy-duty needle and go slow when sewing all the layers together, it's a lot of fabric to get through! Outer panels: I used Essex linen for the outside with light woven interfacing (Pellon SF-101 ShapeFlex) fused to it, and then a layer of Pellon 987F Fusible Fleece fused to that. Straps: My straps are made of a Kokka linen/cotton blend with ShapeFlex fused to it, and a layer of fusible fleece fused to that. When the straps are folded in half and sewn, this means each strap has 2 layers of woven interfacing and 2 layers of fusible fleece. I topstitched twice along each side of the handles for added durability, and stitched Xs on the top joint of each side of the handle. Lining: Linen/cotton blend with canvas interfacing for added durability. Inner Pockets: Linen/cotton blend with canvas interfacing so they stand up better on their own. Extension Panel: I used linen with ShapeFlex fused to it for the outer extension panel, and linen/cotton blend for the inner panel. Pull Tabs: Linen/cotton blend with ShapeFlex fused to it. Cross Straps on top of outer zippers: Linen/cotton blend with ShapeFlex fused to it, plus a layer of canvas inside. Bottom Support: Two layers of Peltex between outer bag and lining. 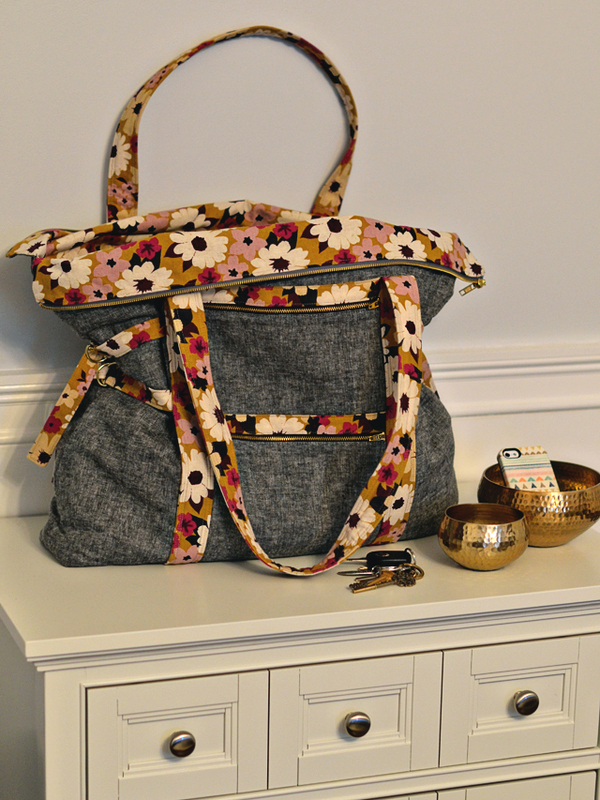 I highly recommend this pattern if you're looking for a stylish large carry-on bag for traveling! I've traveled with it twice so far and I know it's going to get a ton of use! Grrreat! bag, I love it! nice job. It's fabulous!!! I have the pattern and all the fabric! Now looking at yours and drooling over it on Instagram I REALLY want to make it. Man, this is so beautiful! I've cut out my pattern pieces for this bag already, and now you're making me consider a complete redesign :) That black yarn-dyed Essex is so perfect. Great fabric choices! I literally just bought this pattern and material this weekend! Can't wait to try it! So pretty, Holly. I just used this same Essex for my yoga bag and I LOVE it for a bag...just perfect. Loving your hardware, too! Very pretty. I love Essex. It's so soft. You are so good at styling your photos! It really makes the bag pop even more. 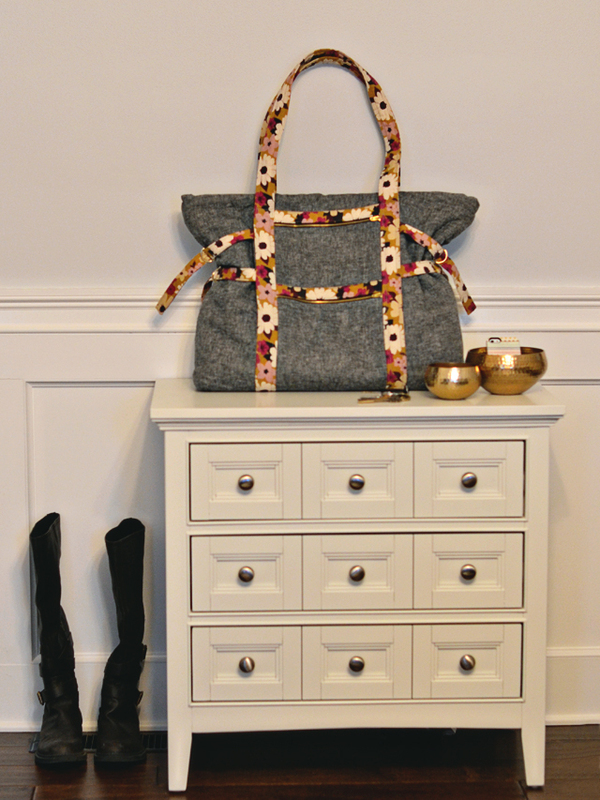 Your fabric choices are perfect, as always...and the bag is just fabulous! I think I need to buy this pattern now. :) Love your version. I've got some black Essex that i think wants to become this bag. The bag looks great! I really love your fabric choices and the gold hardware makes it look even more stylish! OK, that essex somehow just makes it look reallly professional. As in a really serious purse. I love the contrast from how hand sewn purses often do look handmade, and will be thinking hard about copying you! You did a fabulous job on this. Gorgeous! I love it. It's so perfect! I love it, especially with the Essex. Bags are too much fun! This is one of the most lovely bags I have seen. Wonderful bag, love your colors. I could see this in a small botique shop selling for alot of money. Oh how I wish I were good at sewing! I love everything about your bag, it's beautiful! I love this! The essex linen really lends a polished look to the bag and I really like how the gold toned hardware makes it a little more lux. How's the hand on the Essex yarn dyed linens? I had read somewhere that they were pretty lightweight (like shot cotton perhaps? 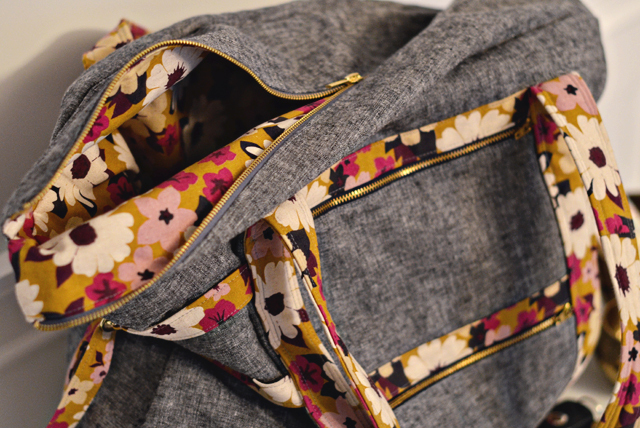 ), but it seems like it worked beautifully for your bag with the interfacing added. What does this have to do with the gorgeous bag?? What do any of these have to do with this posting? Late to the party on this post, but your bag is fabulous! I'm curious if you used the full 3 1/4 yards for the lining - seems like a lot of fabric for this bag.